"The inclusion of the Academy in the Anthrozoology program has allowed students to explore information as it pertains to real-world application. The application aspect of the modules creates a concrete understanding of the material. The quality and depth of the modules allows the faculty to create new authentic learning experiences during class, rather than spending time lecturing." "A fundamental mission of a university is to provide educational opportunities for our students to prepare for their future career. We have been thrilled to partner with SDZGA and expand the classroom and laboratory opportunities of our students to add the perspectives of practicing professionals. Students enjoy the freedom to review modules on their own schedule and to help them envision the next step in their professional development." "The integration of SDZGA modules in our course curriculum has been a phenomenal opportunity to bolster the training and marketability of our students to become professionals in the zoo and aquarium industry." The Big Bear Alpine Zoo has greatly benefited from the Academy courses. We are a small isolated institution with big plans in the works for a brand new modern facility. Although our past has been full of passion, it has lacked the formal training necessary to properly equip us to take on the next growth phase of our organization. Training staff who have no formal education in animal care to meet modern zoo standards, is a task too great for any single leader to undertake. The academy courses enable our staff to learn best practices in animal care and instill a sense of pride here, knowing that their learned skills and information are on par with AZA accredited zoological institutions. We are grateful for the opportunity to learn and for the opportunity to take our institution beyond the level of minimum standards and towards a pathway of excellence in animal care. I was eager to take the courses so I would be able to improve the quality of work we were producing, which would in turn offer better care to our animals and a better experience to our guests. I couldn't wait to get started! After having taken a few of the courses now, the Academy holds up to everything I thought it would be. The wide variety of courses are easy to follow, with lots of interactive material including videos and activities, so time just flies by when I am taking one. I couldn't be happier with the program so I'm looking forward to continuing the journey and learning more with each course I take! The Red River Zoo in Fargo, North Dakota strives for excellence. We are an award winning institution known for our conservation work with cold climate species. With an operations budget of under one million dollars, we are a smaller institution with limited resources. The Red River Zoo is committed to employee knowledge, satisfaction and growth. It is important for us to have employees who understand and implement best practices in all aspects of our work. 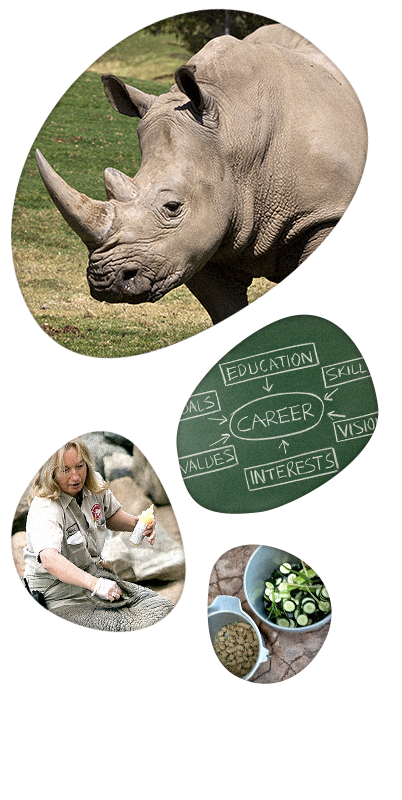 San Diego Global Academy has made it possible for the Red River Zoo to offer our staff members top notch instruction in all facets of our Zoo's operations. From animal husbandry to nonprofit development to understanding regulatory standards and accreditation requirements, San Diego Zoo Global Academy has so many options, there is truly something for everyone on our staff. The Red River Zoo ties incentives and bonuses to course certifications which allow employees to take advantage of the classes at their own pace. Our staff and our organization has truly benefited by this service. I highly recommend it to any organization who strives for excellence. The San Diego Zoo Global Academy has taken training within the zoo community to the next level, by providing a larger audience within that community, the opportunity for training with college level curriculum. Good training programs are complex, detailed and challenging by nature and most zoos don’t have the in house resources to develop, manage and implement quality training programs. The San Diego Zoo Global Academy provides an affordable web-based, peer reviewed contemporary training format that has and will continue to provide our animal care professionals with the most current methods and technologies available thus ensuring our living collections are receiving the best possible care. Recently, the Brandywine Zoo became an Academy Partner and we began offering additional training to our keeper staff and volunteers. As a former keeper, I understand the value of high quality training and the Academy offered a great product at an affordable price, while keeping the content at a high level. The Greenville Zoo has been utilizing the webinar resources for staff training and education even prior to the creation of the San Diego Zoo Global Academy. The offerings today are far beyond anything that we have had access to in the past and the ease of use makes it available to our entire staff. As a small zoo with a limited training budget, Academy gives us the biggest bang for our buck and offers a wide variety of required and informational training opportunities. Brevard Zoo began using our branded eLearning Academy website around the end of October 2013 and we love it! It has become actively used by the volunteers and is now rolling out to the employees. Our partnership with the San Diego Zoo Global Academy has allowed the American Association of Zoo Keepers to take networking and learning to new levels for our members. Thanks to the help of Academy partners, San Diego Zoo Global & Cypherworx, the American Association of Zoo Keepers has entered the world of 21st Century professional development, furthering our progress towards fulfilling our mission of advancing excellence in animal care and fostering effective communication. Our membership at AAZK is at its highest ever and having access to resources through our online platform (AAZK Online) has made a positive impact on our growth. The future of AAZK professional development is expanding, thanks to the help of the San Diego Zoo Global Academy! We are very excited about this partnership and educational opportunity for our members. AAM is committed to providing quality, effective training to help our members with compliance, education, and professional development. The San Diego Zoo Global Academy partners, San Diego Zoo Global and CypherWorx will help us achieve these goals. I am very happy at this time with our ability to give all keeper staff certain targeted classes. New keepers are taking several classes in their first two days before any animal work at all. This is good for the staff and provides our organization with some level of “insurance”. The Animal Behavior Management Alliance (ABMA) discovered a great partnership with the San Diego Zoo Global Academy for providing additional educational opportunities to our members. This year we look forward to our on-going partnership with the Academy as we seek to develop relevant content and continue to provide a valuable resource to our membership. Audubon Nature Institute has been a member of the San Diego Global Academy for a few months, we began by having key personal serve as “test drivers” to help identify specific courses that would directly impact their business and the feedback from our team has been phenomenal! One of our “test drivers” was our safety coordinator and based on the courses she was able to take she has decided to cancel an offsite training, that would have had a big impact on her budget, and will be utilizing the academy to disseminate the information to her team . We are also in the process of setting up a learning lab so we can offer all of our employees a place to go to take courses that are required by Audubon or courses that help our team with their personal development. In just the few months that we have been a part of the San Diego Global Academy we have discovered ways to save money, offer continuing education with AZA courses and help our leaders become stronger leaders. The courses offered by the Academy will help all institutions to fulfill our shared mission of animal care and welfare, environmental education, and conservation, a unique opportunity for training zoo professionals around the globe. San Diego Zoo Global has AZA accreditation coming later this year. One of the accreditation requirements is to provide zoonotic disease prevention training to animal care staff. The Academy is still new to us so last September we launched our first targeted online training effort with our own staff which focused on Zoonotic Disease Prevention. In the space of 16 weeks we saw 450 employees create their own Academy accounts, take the Zoonotic Disease Prevention training and meet our required passing score of 90% or better. Because the training is available on the Academy platform, scheduling was easy and was accomplished without impacting our operations. The training is more consistent than the classroom model. As a former presenter of this class, the Academy training eliminated the need for me or a member of my staff to schedule multiple hours for preparation and presentation of this material in multiple classroom settings. In San Diego, we have never enjoyed greater compliance and ease in meeting this accreditation requirement. For the Birmingham Zoo, the SDZGA training program has distinct advantages over other training programs in three significant ways: the high quality of content, its cost effectiveness, and the flexibility to tailor the programs to meet our employees' needs. Information management and knowledge-building are key elements for any successful profession to prosper. SDZGA has addressed these key elements by creating dynamic programs that enable organizations to provide targeted training for both their internal and external audiences. These programs are offered by SDZGA in a flexible format that allows users to build a range of knowledge, both straightforward and complex, and to do so in a reliable, timely and cost effective manner. Additionally, the learning modules are designed in such a way that allows participants to progress at their own pace and to document their skill building throughout an employees' entire career. As a small zoo the San Diego Global Learning Academy has filled a training niche that was needed for our staff and docents. It gives us a readymade platform that is easy to use. The training our staff at the Santa Ana Zoo has been able to get through the San Diego Global Academy has been such a tremendous resource. The content is so diverse and we’d never have the resources to go into as such depth if we tried to do the training in-house. Being a small zoo we just don’t have the time or resources to develop specialized husbandry and safety training. The online training enables the staff to fit the training into their schedules. The courses have helped our keepers to work safer and have a better understanding of their jobs. I found them to be VERY well laid out, informative and educational! The quizzes and tests were well done and easy to understand.